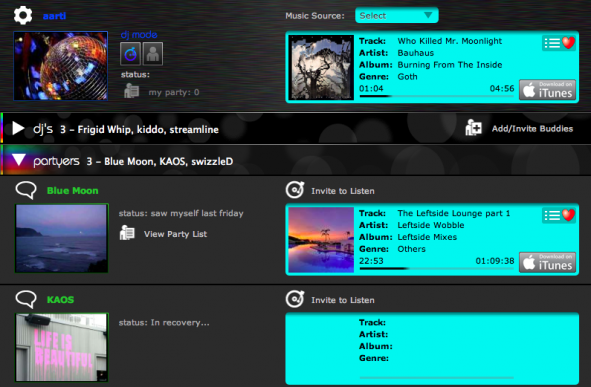 Last time Evolver.fm checked in with listening room app Budtobud, we praised its functionality, but lamented that its interface felt “overthought, with lots of windows, menus, and modes.” Partially in response, Budtobud recently rolled out a revamped, slimmed-down version of the service, but my prognosis is… better, but still a little too cluttered. Of course, the de facto standards for real-time social music listening, at this point, are Turntable.fm and the Spotify app Soundrop. Budtobud’s creators even suspected Turntable.fm co-founder Billy Chasen of taking their idea and running with it after an alleged conversation with Chasen at TechCrunch Disrupt 2010. Later, Chasen got in touch with us to say that he hadn’t even been at the conference in question, so there’s that. Indeed, these apps are apples and oranges, in part because Budtobud lets you stream your downloaded iTunes music to your friends, while Turntable.fm lives in the cloud. The first thing you’ll notice about Budtobud’s Mac-only desktop app is that it’s a bona-fide, installable software, not a web destination. This is a ballsy move. For the bigger brands, who have some name recognition — iTunes, Spotify, et al — it’s not usually a problem to convince music fans to install something, and even then, Spotify is reportedly considering a web version. But for a relative newcomer like Budtobud, it’s a tall order to convince today’s user, who’s used to apps that can be reached by simply pointing his web browser somewhere, to actually download and install something. Even Rdio, a heavy-hitter in its own right, is mainly a web app, and Radionomy, which lets you get paid for broadcasting your music, recently transitioned to the cloud too. Still, because the point of Budtobud is to broadcast music from your hard drive, it makes sense as installable software. Once you’ve made that commitment, a busy window somewhat reminiscent of a Myspace profile will open up. From this window, you can choose between DJ Mode (which turns you into the DJ) or Party Mode (which lets you join another DJ’s “party” and listen to their music). 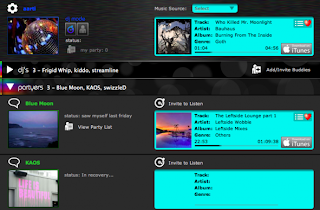 The main window also displays a list of other users currently DJing and what songs they are playing, a list of other partiers and what songs they are listening to, and a list of offline users. We’re not sure if these are comprehensive lists including all Budtobud users; if so, it only had eleven users, which makes for a relatively lackluster experience unless you convince some friends to get on board. Case in point: While we were testing this app, four out of five online partiers were in one room listening to James Blunt while we DJ’d Bauhaus to an empty room. If the users displayed do not include all Budtobud users, it’s not clear why only these particular users are shown. While Budtobud is not particularly complicated to use, now that they’ve removed some unnecessary features we complained about before, we still have a problem with how almost every action — joining a party, another user joining your party, inviting users to listen, etc. — opens a new window. If you’re the kind of person who already has a bazillion different windows open, not to mention a scores of browser tabs and Twitter alerts popping up every minute or so, this becomes obnoxious, if not downright infuriating. We already installed the software… now we have to have a bunch of windows open, too? Ugh. We recently saw an apps somewhat similar to Budtobud, but with a way more streamlined approach SpotCast, which is also available for the Mac. it is built upon Spotify, a service people are likely to already have installed, or would be willing to install, and it has pretty much all the music in the world. As a result, the whole experience happens within Spotify and a little taskbar dropdown menu rather than in two full-blown desktop applications with multiple windows. What Budtobud has going for it that these other two don’t have is the ability to play songs through your local library, so if you have plenty of rarities or even your own recordings, it’s the superior option. Since SpotCast utilizes Spotify, you can only DJ tracks that are available in Spotify’s catalog. For many users, this would not be a deal-breaker, but if you’re in a band and want to host a listening party so your fans can preview a new demo, Budtobud would be the better way to go. Despite the preponderance of windows and apparent lack of users so far, we still consider Budtobud a viable option if you’re looking for a social listening and broadcasting app, but it could use even more streamlining.